This luxury ocean-side condo is located in the Sol y Playa Condominium complex along Playa Corcega in Rincon. It is a spacious 2 bedroom, 2 bath home. It is tastefully decorated and furnished throughout. This townhome-style condo has a large covered balcony with ocean views for relaxing and enjoying the views and sunsets. 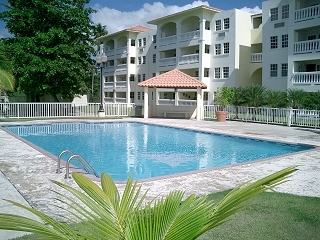 It is one of the best rentals in Rincon at a very affordable price for the amenities. A 2 bedroom 2 bath condo with 1 full bed in master bedroom, 1 bunk (2 twins) + 1 twin in second bedroom. 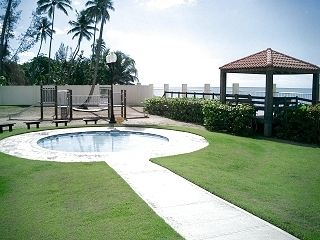 Fully equipped kitchen, Air conditioning in bedrooms,Ceiling fan in dining room, Cable TV w/VCR, BBQ area outside, all bed and bath linens, Washer/Dryer, Phone (local calls only) secure off-street parking, steps to the beach, located in a quiet gated and secured community of the Sol y Playa condominium complex in Rincon Puerto Rico.